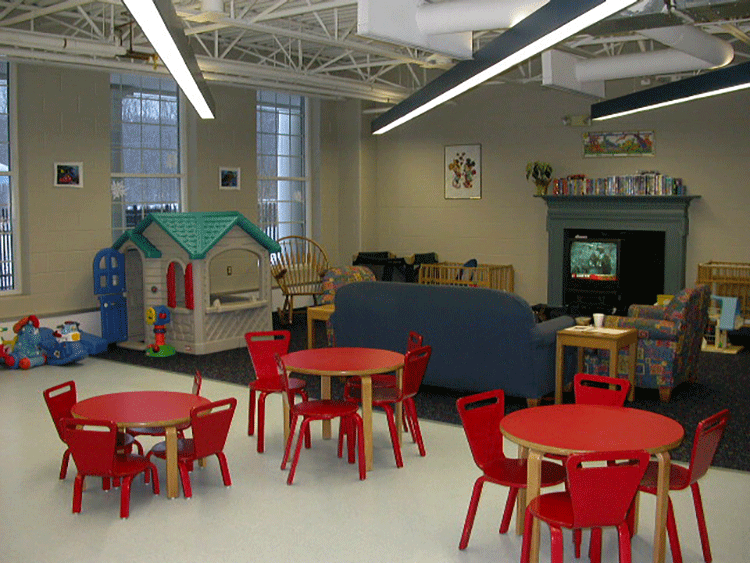 The Child Care Room is open to children age 6 months (minimum) up to 8 years old. Children, including infants, under the age of 13 are not permitted in the Fitness area under any circumstances. For the well-being of all children in the Child Care Room, children with colds, fevers or contagious illnesses are not permitted. The Community Center reserves the right in its sole discretion to not admit children to the Child Care Room who the staff believes are ill. Any child that may become ill during his or her stay in the Child Care Room, must be removed by the parent upon notification by the Community Center staff. Do not bring your child if he/she has displayed symptoms of illness within 24 hours. The parent or guardian of any child admitted to the Child Care Room must remain in the Community Center at all times the child is in the Child Care Room. The parent or guardian must sign each child in and out and also provide the child’s name, the time in and out and where the parent or guardian can be located in the Community Center. In addition, the parent or guardian must supply the name and telephone number of at least one additional emergency contact and the name and telephone number of the child’s primary care physician. The Community Center staff, at its sole discretion, may require a parent or guardian to come to the Child Care Room if a child’s behavior requires parent or guardian attention. In the event unacceptable behavior continues, the parent or guardian may be required to remove the child from the Child Care Room. This rule is for the safety and well-being of all children. A child may be admitted to the Child Care Room for a period not to exceed ninety (90) minutes per visit. Fees per hour per Child are: $3.00 for members, $3.50 for non-members, and $4.00 for non-resident/guests. Residency of the child determines the charges. Parents must pay for the use of the Child Care Room at the conclusion of the visit at the front desk of the Community Center. Child Care vouchers are available and may be secured at the front desk of the Community Center. They expire after one year and are not transferable. Reservations for use of the Child Care Room are recommended in advance by calling the front desk at 440-546-2300. Child Care vouchers need to be purchased in advance in order to make reservations. Cancellations must be called in at least Two (2) hours ahead of time. Failure to timely cancel reservations or “no shows” will result in one hour for each child’s reservation being deducted from the parent’s or guardian’s child care voucher. All medication, whether prescription or otherwise, must be administered by the parent or guardian to the child. The Community Center staff will not be responsible for administering medication to a child under any circumstance. Any diapers, baby supplies, carriers, and strollers must be provided by the parent. Please send any child, who is in the process of toilet training, in with a Pull-up diaper so there are no accidents. A parent or guardian will be called on to provide personal care for their child. Absolutely no food or drink, with the exception of water, may be left for your child during his or her stay. This rule is designed to help avoid food allergy issues for the children present in the Child Care Room. All snacks brought into the Child Care Room will be confiscated. If you feel a snack is necessary, you may personally supervise feeding a snack to your child outside of the Child Care Room and any uneaten food, wrappers or containers must be disposed of outside of the Child Care Room. In ordinance with the Fire Department and Building Department regulations, there is a maximum of 22 children and 2 care givers allowed in the Child Care Room at one time. Reservations shall be honored first followed by a first come–first served policy. Parents must remain in the building. Maximum time of 90 minutes. Please familiarize yourself with the following Child Care Rules. 8:30 a.m. until 2:00 p.m.